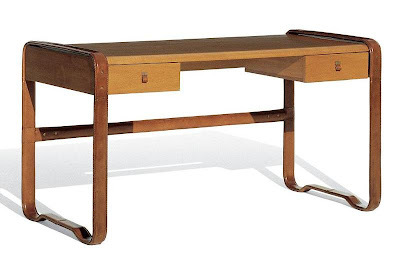 My Favorite Writing Table: Ralph Lauren's "Collection Desk"
Oh, Ralph. He's basically captured every aesthetic I love and produced it for the masses, but the furniture prices make me cry. Clicking through RL Home yesterday (love the new Cape Lodge line), I discovered that he's selling a brass bed nearly identical to the one I found on ebay for around $300 for $10,000. Price gouging like that makes me sick (but, of course is why he has his empire and I have a blog). I'd admired the Collection Desk (above) for years, but never dared look at the price. It's $16,801, which comes out about $16,301 over budget for me. At least all of it's cheaper than Alexandra Von Furstenberg's new table line. Okay, enough money talk. I feel like I might have a tear sheet from an advertisement for that desk. I will have to look and see if I can find it. It's so pretty!